One of the swiftest ways to get your child to change behavior is to have consequences in place and to stick to those consequences. It seems simple when you think about it in black and white, but when you are living that idea in real life, sometimes applying consequences seems harsh. Sometimes it is harsh. As much as we want to raise responsible children who follow rules and take care of themselves, we also want to raise children who are kind, thoughtful, and loving. We want our children to offer grace to others. In order to be able to show grace, they need to have seen what grace is in action. Here are some examples when we can show grace. Sometimes your child is having a bad day or feels super intense about something. Your child might lash out at you or another child. 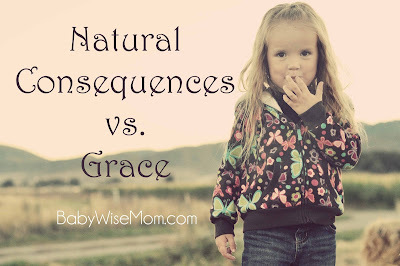 Grace can be offered here as you sit and talk with your child about the situation rather than simply swooping in with the consequence. These are good learning moments if you address it with patience and kindness. In situations like this, you can offer grace while still having a consequence for actions. You might lessen the consequence or even change it. You can be guided in knowing how much to lessen consequences here by the remorse your child shows. I am sure there have been times in your recent history when you have reacted emotionally and regretted it. Show the grace you would like yourself. Hungry and tired children often make poor decisions–just like hungry and tired adults do! This is especially true for toddlers and preschoolers. 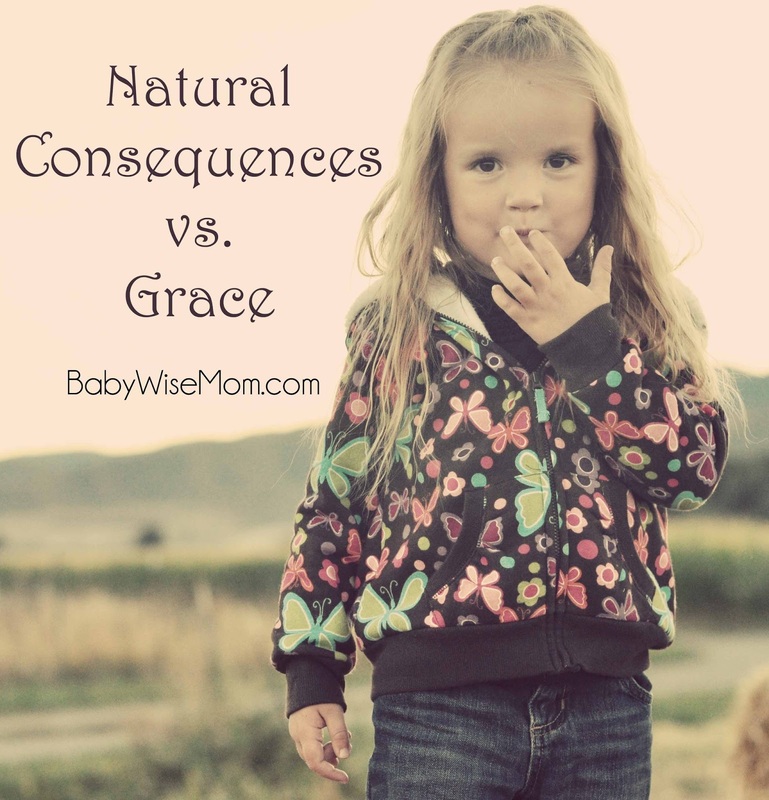 Sometimes if I have a cranky toddler or young preschooler, I will change up a typical consequence and just get the child into bed or get food into her. I have had two children who have a very hard time keeping emotions in check as preschoolers when hungry. As soon as they had food, they were both their normal, sweet selves. So when a tantrum started and it was close to meal time, I would feed first and see how the attitude followed. As my kids get older, I start to expect them to be able to control their emotions and attitude even if they are hungry or tired. I will offer a reminder of the need to still be kind even when hungry or tired before offering a consequence for bad attitude. When life changes, children can become forgetful. When my children start school, there are often times they forget a homework folder or backback somewhere between school and home. I understand the child is stressed on some level with this new life change and having to learn to keep track of things they haven’t had to keep track of before. I offer grace and do what we can to remedy the situation. A big challenge in this area parents face is around school. If the child forgets homework, do you bring it to her at school? If she leaves her packed lunch on the counter, do you run it to school or have her eat school lunch? Children can forget shoes, library books, jackets, and more on either side of school. Brayden and Kaitlyn both had some forgetful moments as Kindergartners. McKenna never did as a Kindergartner, which really shocked me. In first grade, however, she forgot her homework folder at school. Being a first-time situation, we went to school early the next day so she could do it and I could sign it off. A couple of weeks later, she forgot again. Once again I went to school with her early the next day. This is a rare thing for her after all and first grade is a big transition since it is the first year of full day school for us. Shortly thereafter, she forgot again and her teacher called me and I went to the school to pick it up. All along I had been telling her that I would help her out, but if it became a habit, I would stop helping her. On this third occurrence, I explained that if she forgot again, she was going to have to go to school without her homework done. It isn’t a huge deal–she just would need to work faster through her morning work to do her last night’s homework and her morning self-starts in the time allotted. She also wouldn’t get a stamp that day for bringing her homework back. But she doesn’t want to go to school unprepared, so it is a consequence that works well. The day came that she forgot again. She begged me to go to the school early “this one last time.” I reminded her of what I had told her all along. I reminded her that I wouldn’t be doing it again. She still begged and persisted. I explained to her that she needed to learn to be responsible for her things and for making sure her homework made it home. I explained I would rather her go to first grade with her homework undone than to high school. I assured her she would be sure to remember now that she didn’t have that safety net to save her. That was a few months ago and she has not forgotten since that incident. 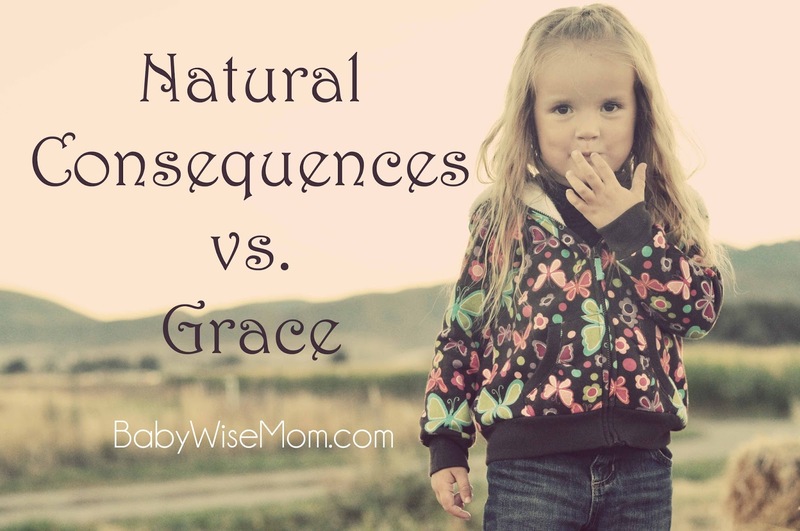 So grace is great initially, but at some point, she needs to learn responsibility. I could have taught her that responsibility earlier by not going in earlier the first time. She probably wouldn’t have taken four times then. But she also wouldn’t have learned that mom is there for her and willing to help her out. She also learned I love her enough to not help her at certain moments in order to help her long-term. Grace can be applied even when the child is older and has learned the lesson. One morning this school year, Brayden called me. He had forgotten his homework folder at home. I took it to him. It was the first time in years he had forgotten. Grace was applied. Many things seem obvious to us as adults, but children don’t always inherently know rules. If you haven’t taught your child something, it might be good to offer grace and interfere with natural consequences that might otherwise follow. Here is a simple example. Your child might be on the monkey bars at the playground calling for your help. A natural consequence to teach your child that the monkey bars are not age appropriate could be to let the child drop alone (I don’t recommend this for a first-timer or a child who can’t drop without getting hurt). Applying grace would be you helping the child down and explaining to either not do monkey bars at all at his age or to only do them if he has asked you first. Another example can be with coloring. Your child might be coloring nicely, then decide the table would look nice colored, also. A logical consequence for coloring on the table would be to take away art privileges for a period of time. If you haven’t taught you child to not color on the table, however, it is a good moment to teach your child that isn’t okay and offer some grace. See Teach What Obedience Looks Like for more help on this. How Do You Decide Which is Right? When deciding which is right, you really are often going with your gut. If any of the above factors are in play, you can err on the side of grace. I am a big believer in consequences and follow through, but your aren’t running a business or a school; you are running a family. You are raising humans. It is okay to show humanity and allow humanity. What you want to be careful of is not offering idle threats. When your child is obviously tired and needs a nap, you might not apply a consequence for yelling at you. But do not, in that moment, say, “If you yell at me again, you will not get to do xyz after nap” unless you intend to follow that through (oh, she was just tired then. It’s okay if she does xyz). When your child is living a moment above, be very cautious about what you say in those moments. Offer yourself grace in these situations, also. You might find one day that you have been letting things slide more than is beneficial for your child. You might realize one day you have been too harsh and need to offer more grace. Don’t beat yourself up. You deserve grace in this process, also. Previous Post Happy Presidents’ Day! Love this post! Thanks especially for the example of homework; that really helped demonstrate the idea for me!